Just hours after news broke that Secretary of State Rex Tillerson was let go on Wednesday morning, the White House also fired his top deputy, Under Secretary Steve Goldstein - who earlier disputed the terms of Tillerson's firing - amid what appears to be an unprecedented State Department purge. According to CBS, the White House called Goldstein to tell him he is no longer needed. Goldstein was then called up to Tillerson's office for a meeting. Tillerson spent the morning at home - after flying in from Africa early Wednesday morning - but he is now at the department. It is unclear if Tillerson will talk to the press today or not. Goldstein had largely fallen into the role as Tillerson's spokesperson, and was unanimously confirmed by the senate last year. He has been on the job for less than three months and is known for being loyal to Tillerson according to CBS. He did attend many meetings at the White House, and consistently said Tillerson was going to bring foreign policy decision-making back to the State Department. "The Secretary had every intention of staying because of the critical progress made in national security," Goldstein said in a statement before his own dismissal and after President Trump tweeted that Tillerson was being replaced as Secretary of State by Mike Pompeo, who had been serving as CIA director. "He will miss his colleagues at the Department of State and the foreign ministers he has worked with throughout the world. The Secretary did not speak to the President and is unaware of the reason, but he is grateful for the opportunity to serve, and still believes strongly that public service is a noble calling." 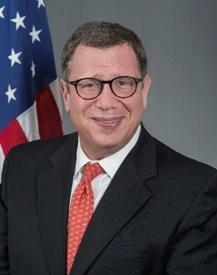 Goldstein was informed of the move shortly after he released the above statement which disputed the official narrative for Tillerson's termination, which said that the former Exxon CEO was “unaware of the reason” for his termination. Goldstein had also told reporters that Tillerson learned of his firing Tuesday morning from Trump’s tweet announcing he was nominating CIA chief Mike Pompeo to lead the State Department, while the White House claimed that John Kelly had notified Tillerson on Friday evening.